Do you have strangers in your house? Many people do, and they don’t have the heart to throw them out. But what do you do with them? How long do you let them live with you? My dad has some old photos of people he doesn’t know. My in-laws have a shoebox full of unlabeled photos from both sides of the family. These are black and white images of stern, unsmiling people unwilling to give up the mystery of their names. 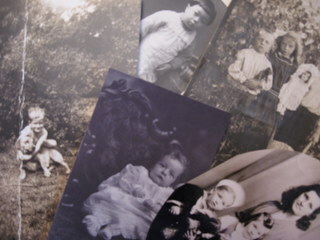 They are the strangers—in boxes, in inherited photo albums, in loose array inside an old trunk. A sense of guilt makes us keep them as we can’t bear to turn away old relatives or friends who once meant something to someone in our family. Often we save them until the next generation inherits them and in turn wonders what to do with them. One method of dealing with these strangers is to take them to the next family gathering where older relatives will be. Someone may be able to identify a face or two. You can even scan some of them and attach them to emails sent to family, or copy them to CDs to mail out. Look carefully at the backgrounds, clothing, cars, signs and other items in the photos as you might be able to identify at least the place or era. Sometimes a little group study session with the family can result in discoveries. Once you identify who is in a photo, be sure to write down in pencil on the back the name and anything else you know about the photo such as year taken, place, event, any meaning behind it. Store photos either in archival boxes or albums made of archival materials. Any photos that are especially meaningful to you should be copied, and you may want to share copies with other relatives. If you choose to display the photo, use the copy rather than the original which should be stored for safekeeping—fine dust or floating particles of oil from frying foods can get inside frames and erode the photo, while light from bright bulbs or sun can also cause damage. If you or anyone in your family has one of those boxes of strangers, the time to try identifying them is now. Before it really becomes too late and you are left with a box of guilt to pass along to your children.